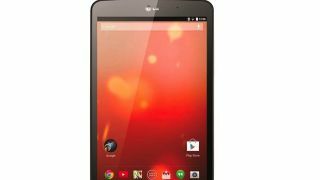 Rumors about the mysterious LG-V510 have been floating around for some time, but that mystery has now been solved - the new LG tablet is officially the LG G Pad 8.3 Google Play Edition. It's the first tablet to receive the Google Play Edition branding, LG said in an announcement. Of course, Google's own Nexus 7 runs stock Android, but the G Pad 8.3 is the first GPE machine from an OEM. One of the the distinction's advantages is that Google Play Edition devices are updated quickly and lack the bloatware with which manufacturers usually stuff devices. The LG G Pad 8.3 Google Play Edition packs a 1.7GHz quad-core Snapdragon 600 chip, an 8.3-inch 1920 x 1200 display, and Android 4.4 KitKat. It's a 16GB device, but includes microSD so users can take it up to 64GB of storage. There's 2GB of RAM, microUSB and a beefy 4,600mAh battery. The slate's specs are in line with the original G Pad 8.3, and it's a few steps up (but only a few) from the Nexus 7. The new G Pad 8.3 is available today in the US Google Play Store in "indigo black" for $349 (about £212, AU$381), though availability for other countries has not yet been determined. This news is directly contrary to what well-known tipster @evleaks said December 9: that the new LG tablet was a Nexus device, which would have rivaled the iPad mini 2. The tip-happy Twitter account reported that "the LG-V510 tablet is indeed a Nexus device," though they conceded that the info was obtained "via tip." This sent rumors swirling LG was behind the Nexus 8 (to be sure, it still could be), with no indication until earlier today that the LG-V510 was really a Google Play Edition tablet. Of course we sort of saw this coming - the original LG G Pad 8.3's model number of LG-V500 is very similar to the new device's LG-V510 number. The new iPad mini and Nexus 7 may want to keep their eyes on LG's new slate; the price is quite competative.